Madison, Wis. – United Way of Dane County Foundation is proud to announce a $10,000 grant to Wisconsin Regional Training Partnership (WRTP)/Building Industry Group Skilled Trade Employment Program (BIG STEP) today. On behalf of the Foundation, our Loaned Executives presented the donation to WRTP/BIG STEP. WRTP/BIG STEP is a non-profit organization that helps the private sector develop a diverse workforce. They focus on construction, manufacturing and emerging sectors to connect job seekers with careers that provide a family-sustaining wage. WRTP/BIG STEP recently began a pilot program in Madison, after beginning in Milwaukee in the nineties. A group of 32 Loaned Executives recommended WRTP/BIG STEP to United Way Foundation for this $10,000 grant. Loaned Executives join United Way for the duration of our campaign to raise funds that will change Dane County lives in the areas of education, income and health. The group made this recommendation during their intensive training. Since 1994, Loaned Executives have made funding recommendations for United Way Foundation grants as part of their training. Since then, the total amount awarded by the LE Classes to nonprofits for one-time special requests now exceeds $220,000. For the first time, the Loaned Executives decided to invest the full $10,000 grant in one organization, WRTP/BIG STEP. The decision was endorsed by the Foundation Board of Trustees and approved by the United Way Board of Directors. The Loaned Executives pointed to WRTP/BIG STEP’s service to families in the Darbo/Washington neighborhood, training for construction jobs, and its pilot program in Madison as the reasons for the recommendation. Last year, WRTP/BIG STEP served 2,990 individuals throughout their program. They trained 1,095 people and connected 766 to employment, with wages averaging $15.36/hour. To learn more, please visit http://www.wrtp.org. 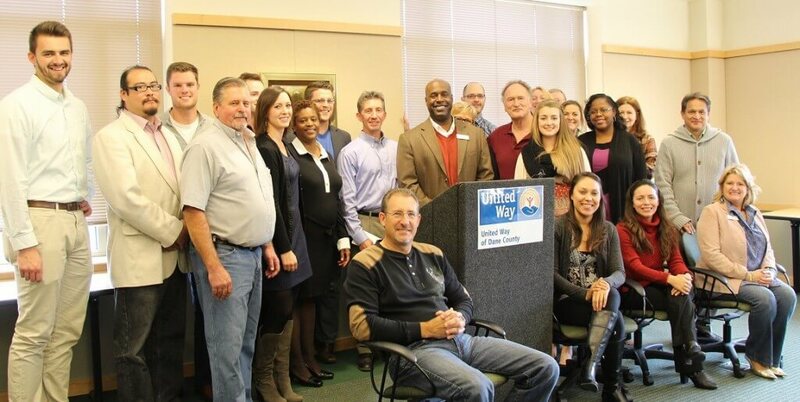 The United Way Foundation exists to support United Way’s mission of improving lives and strengthening Dane County. The Foundation provides a long-term base of support and the flexibility to strengthen our community as it changes. Through the Foundation, individuals and families can leave a lasting legacy of caring. United Way of Dane County is addressing the underlying causes of community issues through our community’s Agenda for Change – six goals focused on three priority areas of Education, Income and Health – that our community identified as most critical to changing lives and strengthening Dane County. Through strategic partnerships and collaborative work, we are achieving measurable results. United Way provides organizations and individuals the opportunity to give, advocate and volunteer to change the human condition in Dane County.